As an added bonus for Moviestorm Subscribers (*anyone who has a current paid subscription or permanent product license for the consumer version of Moviestorm) we regularly publish new items into our free Bonus Content AddOn pack. Click to get a Bonus Content pack license. All the free content will be downloaded and installed the next time that you start Moviestorm. Once you have a Bonus Content license, you do not need to renew your license when we release new bonus content, Moviestorm will automatically update when you start it up whlist online. It's probably worth checking back here occasionally though, just so you are aware of any new items! 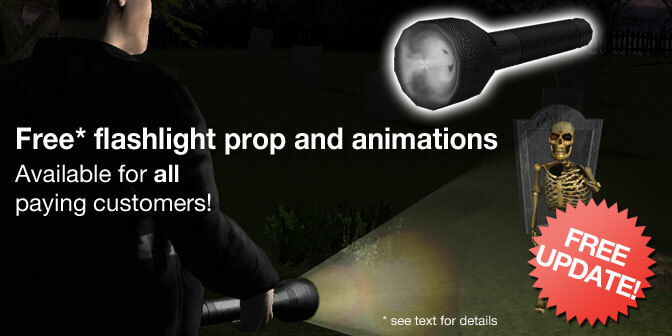 Here's a very useful prop for your crime/ thriller movies; a flashlight that can be used as a held prop, or as a static set object. There are three states for the torch, an "off" state and two "on" states with different beam strengths. Characters can get the flashlight and put it away, as well as aiming it in different directions. A must for any crime, thriller, horror or sci-fi movie! 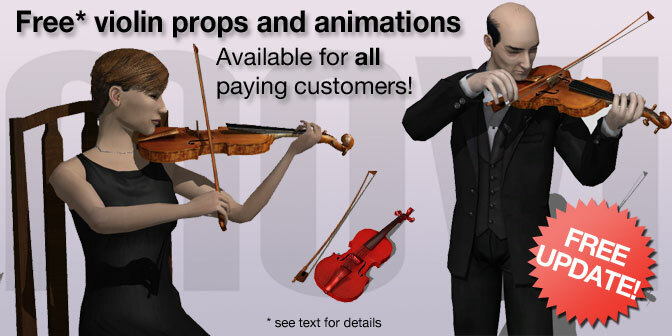 This update to the Bonus Content includes a classical violin, which can be used on set as a static item or by your characters as an animated held prop. It includes a wooden or tintable body material and character animations so that it can be played on the low and high strings. Combine this prop with the piano, drum kit , saxaphone, trumpet and guitar items and you'll soon have a full band to perform in your movies! Some more everyday items in this update for the Bonus Content, in the shape of an electric-razor with animations for your male characters, and a toothbrush with animations for both sexes. Both items can be used as static or held props, depending on your requirements, and the toothbrush can be used in either hand. For this update, we’re bringing you a microphone held-prop so that your characters can perform a selection of singing, interviewing and recording animations. 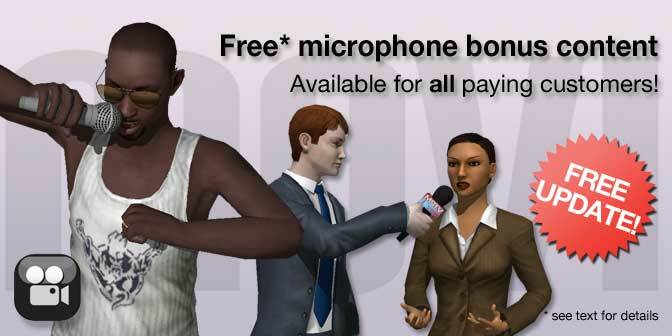 Unlike microphones available in our other packs, this one has a wider selection of animations allowing your characters to sing, rap and carry the microphone from one location to another, or perform interviews in a outside-broadcast type way. Also, the microphone itself can be shown as a singing microphone, outside broadcast microphone or voice recorder, depending on your needs. A hand held microphone with three variations: Singing Microphone, Interview Microphone and Voice recorder. With Halloween quickly approaching, we’re bringing you a selection of props and animations to help you shock and scare your audience! There’s a tragedy/ comedy mask (always particularly unsettling when used in the correct context! ), and a hockey mask that you can customise by adding your own texture. In addition to the masks, we’re also providing a set of gruesome weapons for your characters to wield, in the form of a machete, a hot poker and a plank with protruding rusty nails! We’ve also included animations for these props so your maniacal characters can intimidate even the most hardened horror aficionado. We’ve given you the tools, now go and terrorise your virtual neighbourhood! We're giving away a very simple prop this week, but I have a feeling that it's going to be used for many Moviestorm projects! What we have here is a pot of pills that can be used as a static prop, or a held prop depending on your requirements. 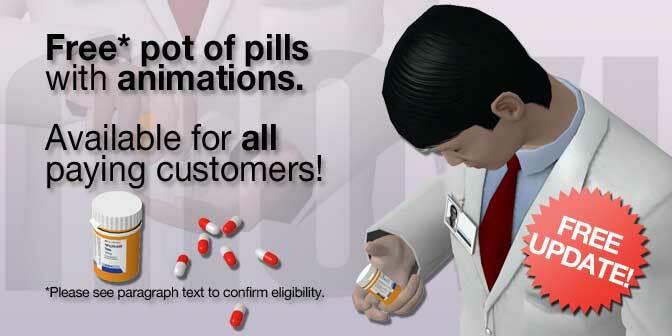 There are also animations for opening the container, getting a pill and swallowing it. You can also place the pot and/ or pills on any surface in your set - great for a crime-scene, hospital set or domestic drama! A customizable pill pot, which can be recoloured, or have it's lable changed. Note Use this animation again with 'Vanish at end' to make the pill vanish. 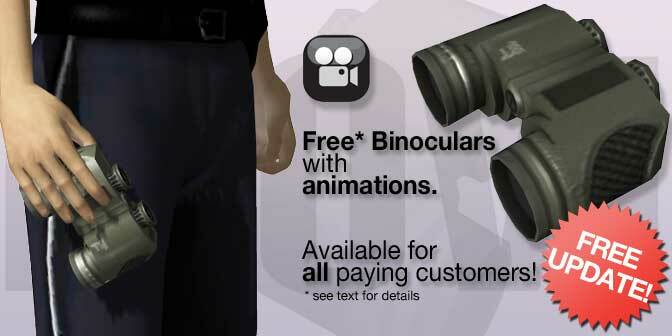 A very useful set of binoculars can be found in this update to the Bonus Content. As well as being a static prop, these can be held by your characters and there's a selection of animations to cover most situations. Couple this prop with the "Binoculars" and "Binoculars Night" video filters, and you've soon got a spy/ surveillance/ action sequence! 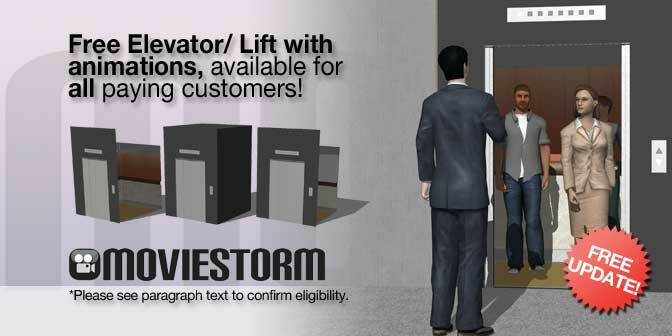 Another useful addition to the Bonus Content Pack, this time in the form of an Elevator that your characters can occupy. There's multiple mesh options so that you can have a freestanding design, or mount the elevator into a wall, and all the materials, buttons, lights and images can be tailored to your set for continuity. Finally, there's all the character animations required to allow your characters to interact with the prop (please see the list of animations below). An Elevator/ Lift with tintable materials, buttons with on and off states, option for interior painting plus animations to open/ close the doors and character animations to operate the controls. 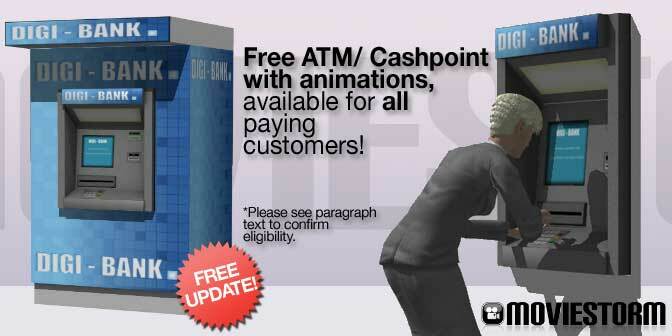 In this update to the Bonus Content pack, we are giving you an ATM/ Cashpoint machine, with which you characters can interact. There's a free-standing machine and the hole-in-the-wall type, suitable for any Moviestorm scene. Two sorts of automated teller machines - an ATM embedded in a wall section, and a freestanding one. Here's a couple of Asian-influenced hairstyles that suit all ethnicities of male Moviestorm characters. There's a "straight fringe" style and a "side-parting" style, which both offer less extreme styling to our other haircuts, making them ideal for background characters or for the lead characters that have less extreme profiles. 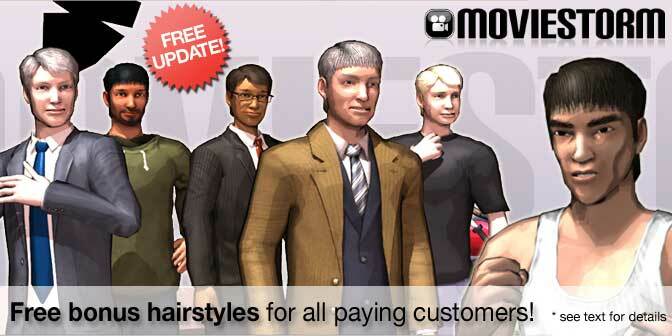 "Hairstyle Asian Straight Fringe" male hairstyle with morphable length and 13 color variations. "Hairstyle Asian Parting" male hairstyle with 13 color variations. 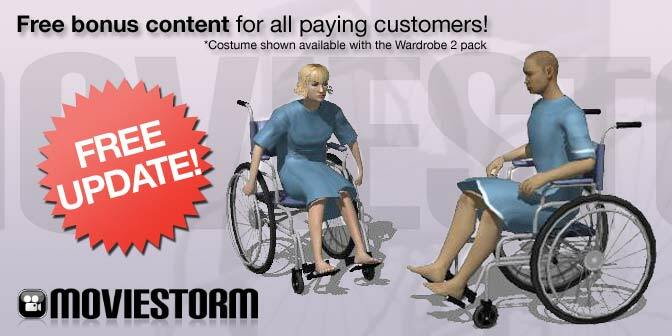 This update provides a wheelchair, which your characters can sit in. It is mobile, so as well as the characters being able to push the wheels around, you can shift-drag the wheelchair around the set, like a car. 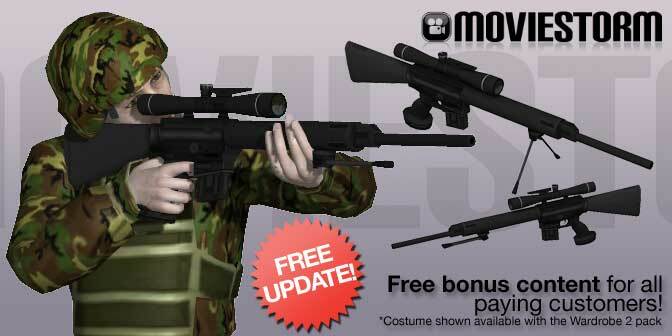 For this update to the Bonus Content pack we're giving away a sniper rifle! As you can see from the images, the rifle can be used as a static prop, or can be used by your characters in the standing or prone positions. A Smartphone with a collection of animations so that your characters can now call, take photos, swipe the phone's screen and other related actions! The phone also features a tintable case and four screen variations. A Smartphone held prop, with tintable case, and four screen variations all with a user image option.